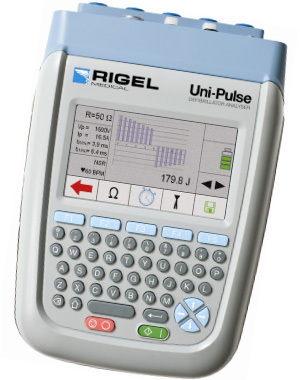 Rigel Medical will be launching its new UNI-PULSE defibrillator tester while previewing its MULTI-FLO infusion pump analyser at Arab Health 2012 (Booth 7F14). The move comes as the company continues to benefit from strong branding and a range of advanced value added products, which are spearheading growth and sales across the Middle East. The compact, lightweight and portable UNI-PULSE defibrillator analyser will be launched in the Middle East at the show and features advanced measurement technology to verify the safe operation and functionality of all defibrillators. The battery powered analyser offers both manual and automatic test programs for testing of all mono-phasic, bi-phasic and pulsed waveform defibrillators. The MULTI-FLO analyser also complies with IEC 60601-2-24 requirements and can be used for high and low flow, occlusion, back pressure and bolus measurement and features variants of one, two and four independent channels. Each channel can be tested simultaneously across a range of 100 μL (microlitre) to 1,000 mL per hour with results stored in the instrument’s large internal memory. John Backes, divisional manager for Rigel Medical, said: “We’re delighted to be launching these important new products at Arab Health - a key show for us. “We are committed to bringing innovative new products to market to meet customer requirements and we’re sure the many new features and benefits UNI-PULSE and MULTI-FLO offer will garner significant interest. “Our new brand positioning, built around involving customers in the development of test equipment, will continue to underpin our marketing push at the show and throughout all the territories in which we operate. The new instruments are part of a range of advanced analysers, simulators, testers and accessories from Rigel Medical. Also showing will be the Rigel 288 electrical safety analyser, the Rigel Uni-Therm (formerly the 377) electro surgical analyser and the Rigel UNI-SIM. This is the industry’s first all in one vital signs simulator, capable of undertaking six synchronised vital signs parameter tests simultaneously: NIBP, SpO2, ECG, temperature, IBP and respiration functionality tests. If you would like to see these analysers/testers in action please request a demonstration and we´ll be more than happy to show you.